Tenth Ward Distilling Company has launched a crowd funding campaign via Indiegogo to fund the second phase of their expansion- the build out of their Cocktail Lab and Barrel Program. They have also opened their new location at 55 E Patrick St which is the first phase of their expansion. Saturday, Nov. 17th from 11am -9pm at Tenth Ward Distilling Company, 55 E Patrick St, Frederick, MD customers can visit the recently expanded Tenth Ward location, tour the barrel room and event facility, and view construction plans for the crowd funded cocktail bar build out. In celebration of Maryland Spirit Month, Tenth Ward is releasing their Autumn Liqueur which is available for sampling and bottle pick up. The Tenth Ward Indiegogo campaign will fund the build out of Tenth Ward’s new “Cocktail Lab” which will serve to educate consumers on how they can mix with craft spirits and it will also provide an additional revenue stream to the business. 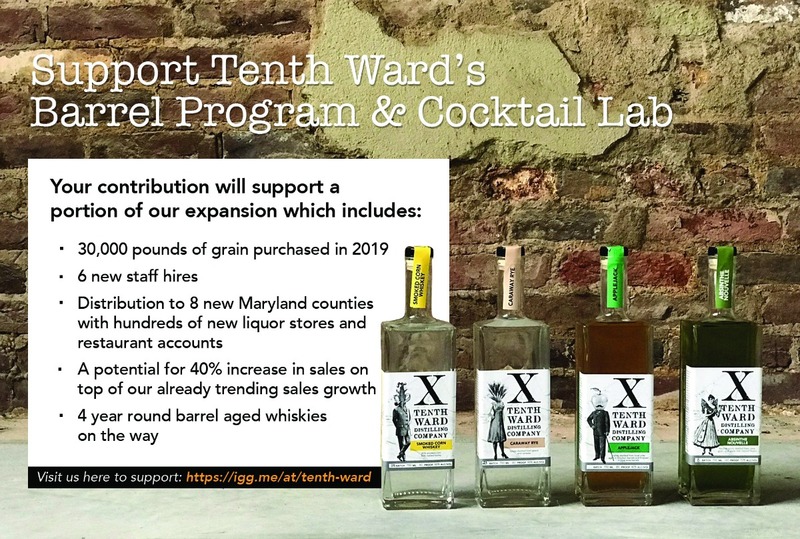 The campaign will also fund the build out of Tenth Ward’s barrel program which will support the development and growth of barrel-aged spirits. 3. $100 - Cocktail Voucher + Swag Bag + Unlimited Tastings: $100 for the swag bag, a set of Tenth Ward rocks glasses and unlimited tasting flights for up to a year. The crowd funding campaign link can be found here https://igg.me/at/tenth-ward and the Facebook event page can be found here https://www.facebook.com/events/491197798052809/ .